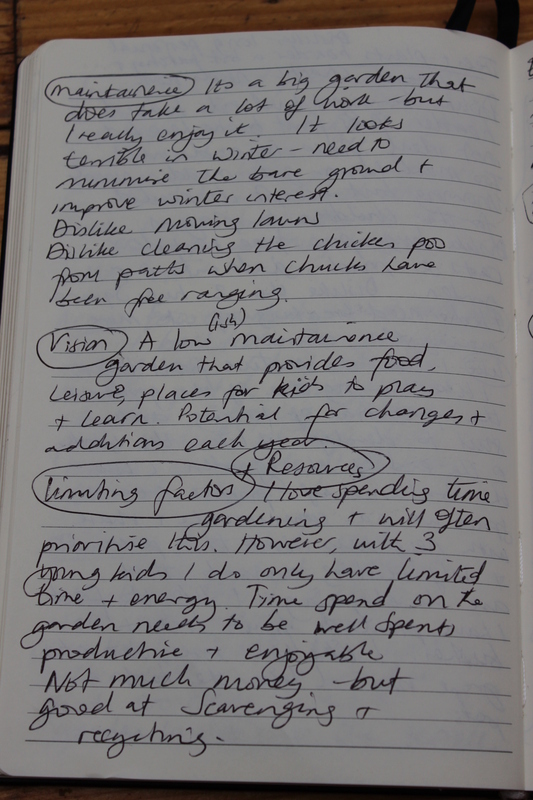 My garden design – Beginning the design process. Designing my own garden seems like a sensible thing to do in the early stages of my diploma because I know this little patch of land so well. We have lived in this house for six years, so have spent a lot of time observing and interacting with the garden. We have made various changes over the years, some more successful than others. 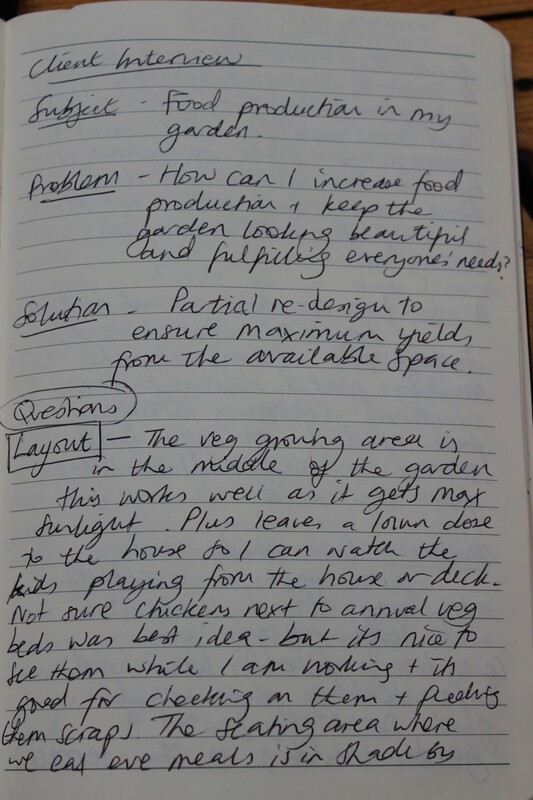 My design will focus on making the food production areas more efficient. I aim to be able to eat something from my garden everyday from May to October. The photo below shows the view from the mid-point of my garden back towards the house. The plot is approximately 130 foot long (190 foot long if you include the house and front garden) by 25 foot wide. It faces south and has a small brook running along the end of the garden. It was the garden that sold us this house, we were blown away by the size and aspect of it compared to others we had looked at. The house was much the same as our old house, even slightly smaller maybe, but with scope for extensions. Now that there are five of us in the family, we fill the house almost to bursting point, but the garden still feel generous with space to tackle a new project almost every year. I love it dearly. I have been thinking and reading lots trying to make sense of the design process. I have drawn up the diagram below to show the stages that I intend to go through while designing the garden. I have been reading ‘Permaculture Design’ by Aranya which has been a great help in breaking down the process into manageable chunks. I am open to adding to or deduction from this design process diagram as I gain experience, but this was a useful exercise for me to get everything straight in my head. The temptation when designing a garden is to jump straight into the ‘designing’ or ‘doing’ stages, but Permaculture has taught me the importance of holding back and honoring the journey. That is very hard for an impatient person like me! Today I will be recording what I have done in the ‘Observe’ and ‘Think’ sections of the action learning cycle. I hope that by keeping a careful record of the process, it will help make this design more thorough and effective as well as helping clarify the stages for my future design projects. Permaculture design tools used are in recorded in bold type. THE PROJECT – Redesign the food production areas of my garden to make them more efficient and provide us with something to eat everyday from May to October. The garden still needs to look beautiful and fulfill the needs of all family members. 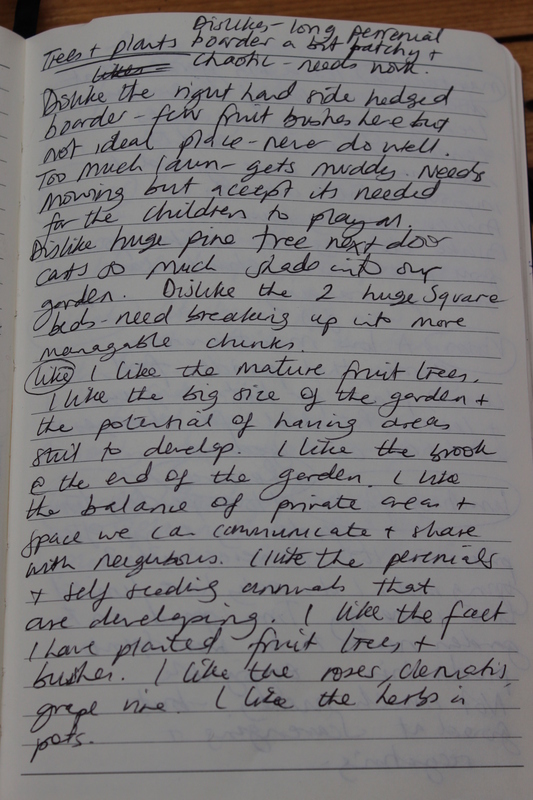 OBSERVATIONS – I have been observing the garden for six years now and so I feel I know it pretty well. I have been adding a blog post every month, ‘My garden in …’ This includes images of the garden, info on my thoughts, feelings, harvest and planting. Also weather descriptions, sunset/rise times and max/min temperatures. I want to begin mapping the shade patterns at different times of the year. Rather than using PASTE (plants, animals, structure, tools, events) I used the titles suggested in Aranya’s book. Layout, access, structures, trees and plants. Details are below under Client interview and see the relevant photo of my notes. PASTE would have repeated these items so it seemed unnecessary to use both of these design tools. MAPS – I have looked at maps of my garden on google maps and on the deeds of our house. I have made careful measurements and drawn up a base map showing the boundaries, major structures, beds, trees, brook, lawns etc. I studied geography for A level and looked at maps for part of my Fine Art degree, I love maps and find them fascinating. I mapped desire lines through my garden and noted where paths where needed. I looked at Zones and Sectors. SOIL AND UTILITIES – I still need to take some soil samples and will do an additional blog post about this. In my general experience of gardening on the site, up near the house it is quite clay-ish, improving the further you go down the garden. There are patches of lovely soil where old compost heaps were located. There are areas with terrible rubble, glass and junk buried in them. When we first moved here we even uncovered an old fireplace, a motorbike engine and a lovely old tin bread bin buried in the garden. The metal was recycled but the bread bin sits in my kitchen now holding magazines. We have mains water, there is an outside tap and an old ceramic butlers sink that we salvaged. A buried water mains pipe runs across the top area of lawn. We have one light switch under the cover area by the side of the house. If electricity is required we have a few long extension leads. LIMITING FACTORS – I thought about the shaded sections of the garden as being a limiting factor for fruit and veg growth. The big trees could also be a limiting factor due to their roots, but they all give us a yield in other ways through fruit, places to play or shade. I am wasting a lot of water and could capture and utilise it better.We are limited by the space available. I am limited by the time I have available and a lack of funds. RESOURCES – We often have access to free wood for building or burning. The chickens provide us with lots of resources. I have tools, knowledge, enthusiasm and the will to work in my garden. My husband and the kids are keen to be involved too. We compost our garden and food waste, either via the chickens or directly into the compost bin. CLIENT INTERVIEW – Since I am both the designer and the client for this project, I interviewed myself. I intend to also interview my husband and the children and take their wants and needs into consideration. 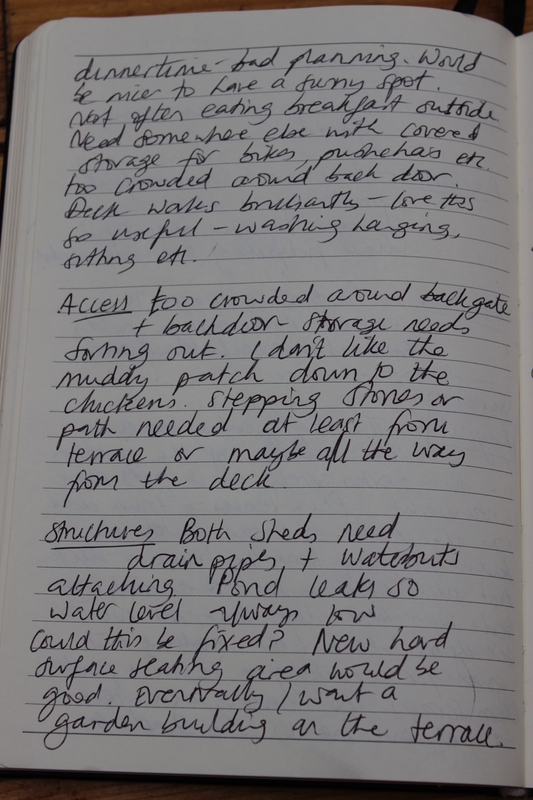 The photos show my scribbled notes. I took inspiration from my questions from Aranya’s book; I looked at the current situation, layout, structures, access, plants, trees, like and dislike and maintenance. Then wants and needs, values and vision and finally practicalities like timescales and finances. FUNCTIONS, SYSTEMS AND ELEMENTS – From the client interview I was able to identify key functions that were required of the design. I then thought about the systems that could provide these functions and the elements that made up the systems. The tables below shows my working. Please note that on the second photo I have accidentally reversed the titles. It should read, Function, System, Element. As the first photo shows. 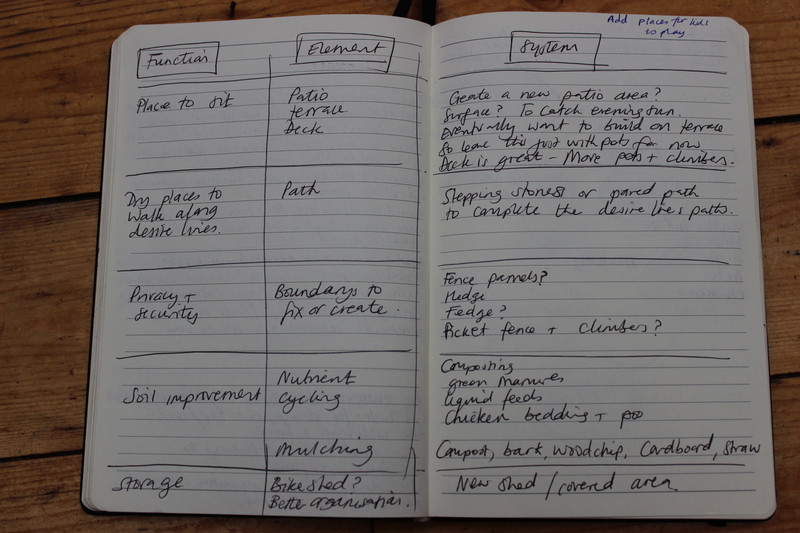 Next time I will look at key functions, remedial actions required and identify SMART goals. 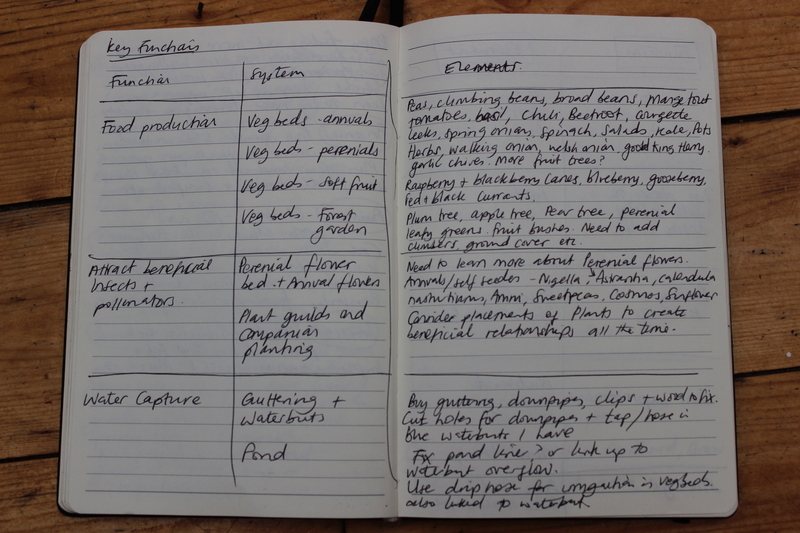 I will then apply permaculture ethics and principles and move onto the ‘design’ stage. This entry was posted in Uncategorized and tagged 10 Designs, design tools, My garden design, Permaculture, Permaculture Diploma by emilycrofton. Bookmark the permalink. Awesome! Wishing you much success with your new garden. I hear you, I’m keen to jump into action but I see that your process allows for great clarity and minimises risks of not fulfilling your purpose or missing something and having regrets later. Thanks, yes the planting up is coming on really well. 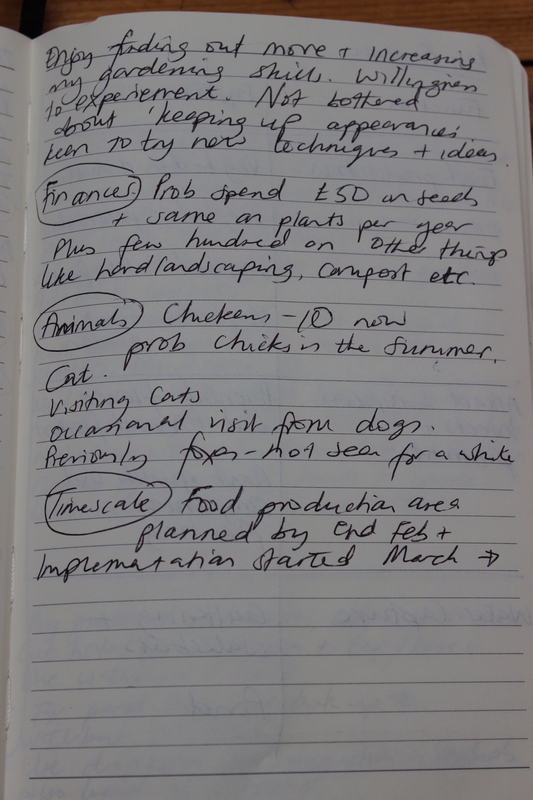 I am remembering to refer back to my plans often, but have found I squeezed far too much in on paper than is possible in real life!